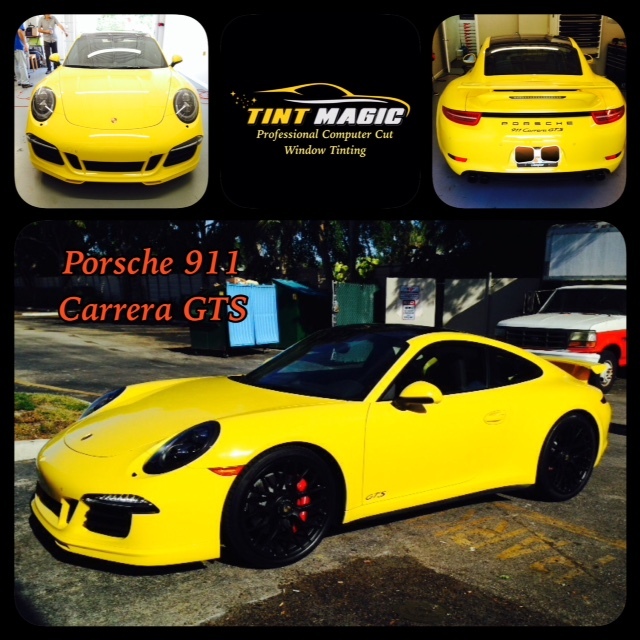 Porsche 911 Carrera GTS at Tint Magic Window Tinting Coral Springs. We use computerized cutting system pre-cut films before placing it on glass for a perfect fit everytime. Call us for a free estimate! 954-840-7883. We are located at 11344 Wiles Road Coral Springs, Fl 33076. Porsche Carrera Window Tinting looks amazing on Carbon CXP 70% that rejects 56% of solar energy and 99% of UV Rays. Porsche is sticking to a well-proven recipe with the GTS versions of its current 911. As before, the brand claims that the GTS models “close the gap” between the Carrera S andthe delectable GT3. But in fact, the new variant is positioned much closer to the S versions, which its flat-six eclipses by 30 horsepower. Available as a coupe and a cabriolet and with both rear- and all-wheel drive, there is a GTS for almost everyone in the lineup, provided they can pay the price of entry—which is significantly higher than the S models before you start accounting for options. The GTS is significantly better equipped than the S; it starts at $115,195 for the rear-drive coupe and rises to $133,795 for the all-wheel-drive 4 GTS cabriolet. In addition to the extra power, GTS cars also get the Sport Chrono package, which sharpens the 911’s responses at the push of a button; PASM active suspension, which can drop the car by 0.4 inch; a dynamic light system with bixenon headlamps; and an interior swathed in faux suede and leather.